Jawaharlal Nehru Stadium (Hindi: जवाहरलाल नेहरू स्टेडियम), in Delhi, India, is a multipurpose sports arena hosting football and other sporting events, as well as large-scale entertainment events. It is named after the first Prime Minister of India. The all-seater facility seats 60,254 spectators, and up to 100,000 for concerts. 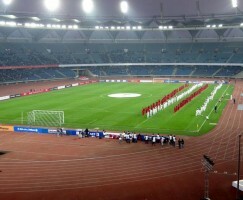 In terms of seating capacity, it is the fourth largest multipurpose stadium in India and the 51st largest in the world. The stadium complex also houses the headquarters of the Sports Authority of India (SAI), the field arm of the Ministry of Youth Affairs and Sports, Government of India, and Indian Olympic Association (IOA).